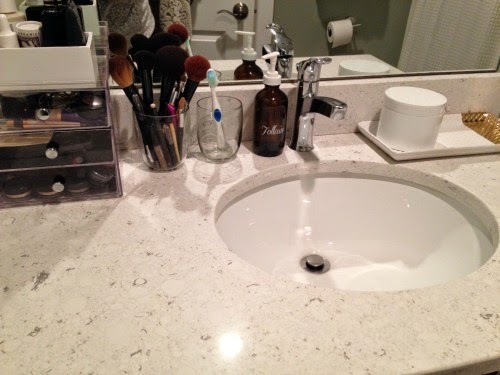 This post is very much overdue, but I am finally getting around to sharing the final look of my bathroom upgrade! 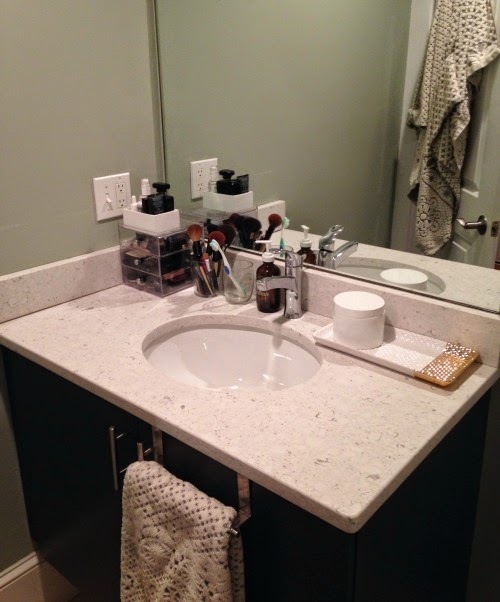 If you remember this post from back in the fall, I tapped my cousin, lady of great taste and designer, Jessica Ford, to help me update my bathroom. As I am in a rental, I was not going to change what I was given for the "bones" of the room: paint color, sink, cabinet, tiles, etc. She helped me gather some ideas for a fresher look with muted tones. Here is the before...all the greens had started to overwhelm me! Here are the after shots! The whole project ended up costing me just around $200! 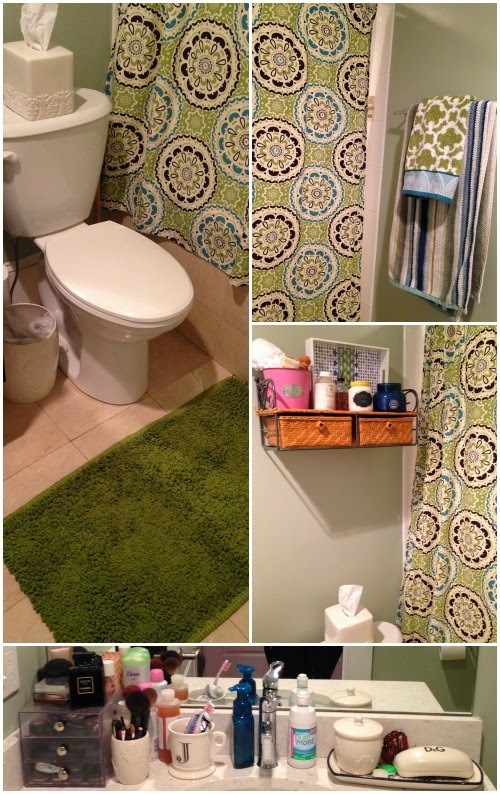 I gathered some tips for upgrading your bathroom on a budget. The Anthropologie mat was my "big splurge", but I saved by finding items at Home Goods and Target that I had in mind at higher price points. For example, the original glass storage jars Jess found were $16 each (buying 2 would be $32 + shipping) from Rail19. The ones from Home Goods cost me around $16 total. 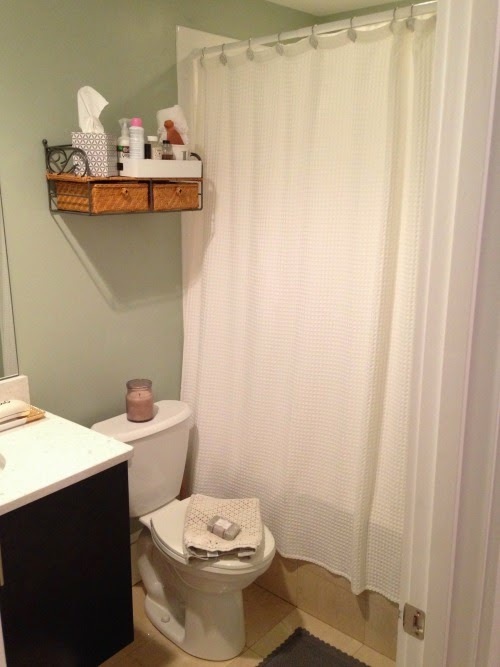 Another example is the shower curtain. 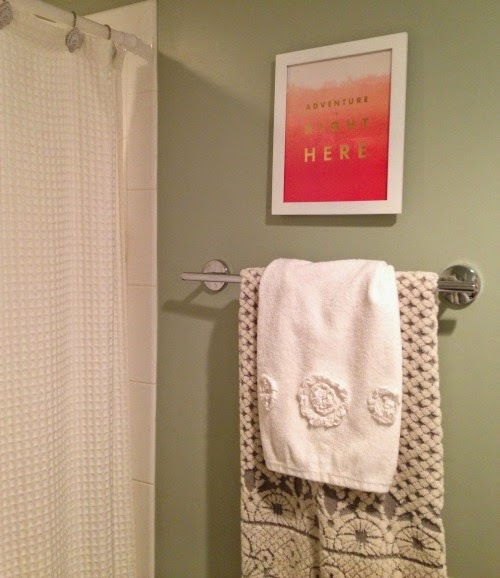 Jess originally sourced the waffle shower curtain from West Elm for $49. I re-used a couple small white hand towels, the shower hooks, and a tray. I was going to buy a new print but decided to use one that I got through A Beautiful Mess Happy Mail that went with the pop-of-coral color palette we had in mind. I mixed styles with the glass and plastic containers that just seemed to work together. If my budget were no object, Jess would've worked major styling magic! All very amateur photos shot by me. i love the new look - very streamlined, clean and calming! love it!! i love the "after"pics of makeovers. Looks great! Love the tray and wall shelf!